On October 19, 2016, manufacturers, business leaders, and policymakers from across the state met in Indianapolis to honor companies that have made outstanding contributions to the development of a healthy business environment in Indiana, and to the state’s overall economic wellbeing. 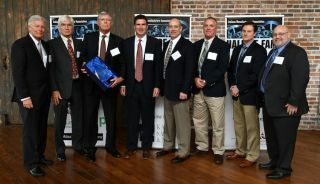 Draper, Inc. was among the select group of companies acknowledged at this inaugural event, and was selected as an inductee into the newly created Indiana Manufacturers Hall of Fame. The Hall of Fame Luncheon was keynoted by former Indiana governor and current Purdue University president Mitch Daniels.